Fargo faces challenges from regional flooding due to the northern flow of the Red River of the North and regional impermeable soils due to its past as a glacial lake. Impermeable soils also contribute to localized flooding, and the existing shallow grades fail to provide proper conveyance to the inverts. Recent impacts due to climate change are exacerbating the situation and compounding negative impacts on water quality and quantity during local flooding events. As part of BLD's work for the Downtown Infocus Plan, BLD has created unique analysis tools that delineate the micro-watersheds to assess the risk of local flooding. This analysis will allow for the quantification and planning of future blue/green infrastructural solutions that will help create a low energy solution to Downtown's issues as well as create a unique downtown atmosphere. 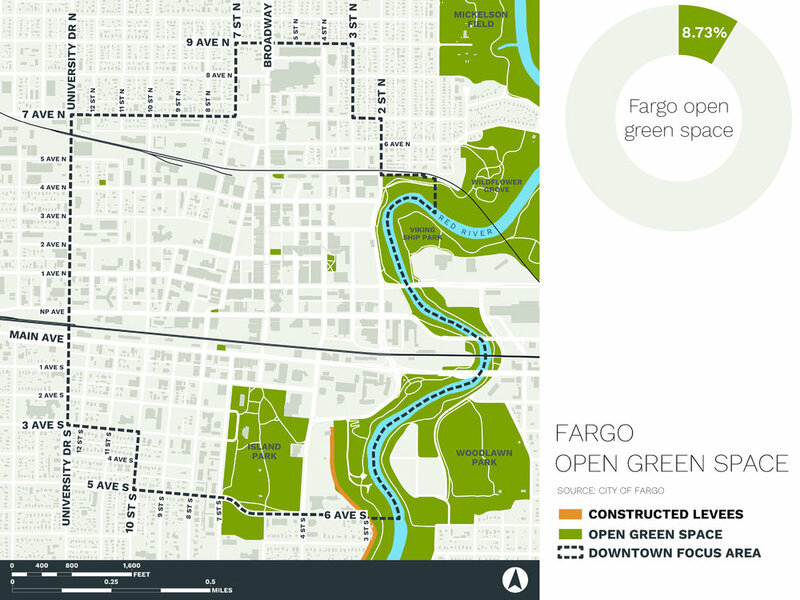 From these assessments at the planning scale, BLD will continue to refine this work and analyses and look for more site specific solutions that work in tandem with proposed transportation upgrades in the upcoming Downtown Fargo Stormwater Master Plan.